"The finished painting gives enough information from the artist and leaves enough out, allowing space for the viewer to access the work in their own way and let personal meaning resonate." Allowing intuition to rule the process by which her art is created, painter, sculptor and installation artist Gwen Avant seeks to reveal the unknown if only for a moment in her evocative abstract paintings. Proficient in a variety of media, Avant often uses oil, beeswax, acrylic paint and chalk in the creation of her imagery. 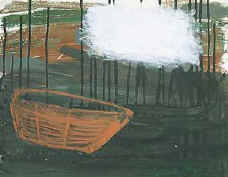 Boats and bowls regularly reveal their ghostly outline on the surface of the canvas; traceably present but purposely remaining both visually and meaningfully obscure.